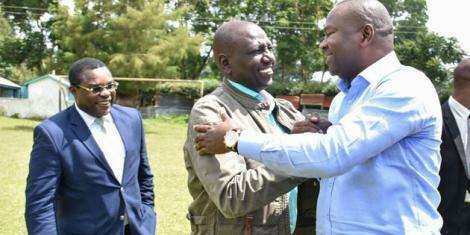 Tuesday April 16, 2019-Alego Usonga lawmaker Samuel Atandi has defended COTU Secretary General, Francis Atwoli, following his recent anti-Deputy President William Ruto remarks. Speaking on Monday, Atandi backed the remarks by Atwoli that Ruto will not be on the Presidential ballot come 2022 because of his involvement in mega corruption scandals in the country. He termed Atwoli as a true statesman and an experienced leader whose remarks should be taken very seriously. He cautioned the DP to ignore the statement at his own peril, advising him to instead swallow his pride and approach Atwoli for a way out; otherwise he would end up jobless like former Sports CS, Rashid Echesa. At the same time, Atandi bashed the DP for allegedly dispatching his foot soldiers to bash Atwoli to attack the COTU boss after remarks.